Pro-Russian rebels in eastern Ukraine have allowed Dutch investigators to examine bodies from the crashed Malaysia Airlines plane at a railway station. 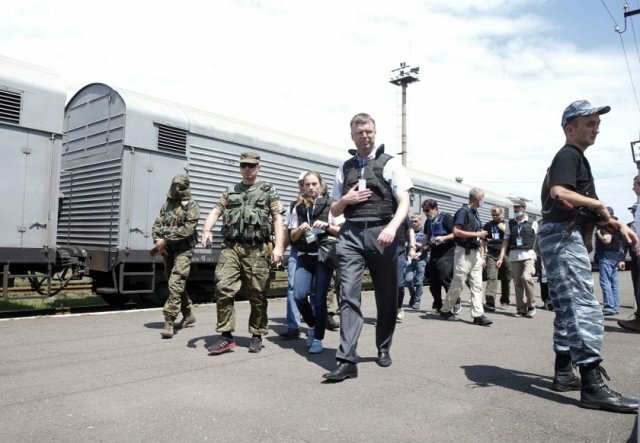 The three Dutch experts said the train might leave the town of Torez later. All 298 people on board flight MH17 died when it crashed over the rebel-held area on July 17. The US and other nations say there is growing evidence of Russian complicity in the crash. Meanwhile, heavy fighting is reported in the main rebel-held city of Donetsk. The clashes – involving heavy weapons – are continuing near the city’s airport and the railway station, eyewitnesses say. The Dutch experts from the Disaster Victims Identification team are the first international investigators to arrive in the region where the Boeing 777 went down after being reportedly hit by a missile. Monitors from the Organization for Security and Co-operation in Europe (OSCE) have been at the accident site, but their access to the wreckage was limited by the rebels. On Monday, the Dutch experts examined some of the 196 bodies kept in refrigerator wagons in Torez, some 9 miles away from the crash site. “I think the storage of the bodies is of good quality,” team leader Peter van Leit said after the inspection. The investigators added that they had urged the rebels to allow the train to leave. Correspondents in Torez said the smell of decay emanating from the carriages was overwhelming. The Dutch experts also later visited the crash site, where some passengers’ remains were still lying in bags exposed to summer heat. Russia’s media fears MH17 will shape future diplomacy. “The situation surrounding the Malaysian Boeing 777 shot down over Ukraine is becoming a key factor in world politics,” says business daily Kommersant. Ukraine’s press continues to accuse Moscow. Popular tabloid Segodnya leads with “Ukraine has enough evidence of Russia’s guilt”. Russian and Ukraine media agree on the further souring of relations. A Malaysian team of 133 officials and experts, comprising of search and recovery personnel, forensics experts, technical and medical experts has arrived in Ukraine. A separate UK group of air accident investigators is also there. However, the government in Kiev says it has been unable to establish a safe corridor to the crash site. There has been international outcry over the way rebels have handled the situation, delaying access to the site and allowing untrained volunteers to comb through the area. The rebels have said they will hand over MH17’s flight recorders to the International Civil Aviation Organization (ICAO), but the US state department has accused rebels of tampering with other potential evidence. Heavy machinery could be seen moving plane debris at the crash site on Sunday. Russia again on Monday denied allegations it supplied the separatists with an anti-aircraft system known as Buk that was allegedly used to shoot down flight MH17.